Gale-force winds and unusually high tides have caused damage across areas of eastern and northern Scotland. 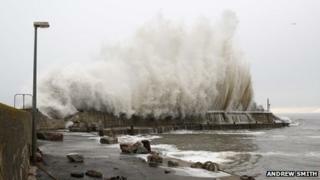 Huge waves caused up to £500,000 damage to North Berwick harbour in East Lothian, as sea defences were swept away. A 15m section of the harbour wall collapsed in Lossiemouth in Moray. And residents of a sheltered housing complex were evacuated after coastal flooding hit parts of Aberdeenshire. Gerry Hughes, chairman of the North Berwick Harbour Trust Association, said he believed the storm that hit the town overnight between Friday and Saturday was the worst in more than 100 years. He added: "This was a massive storm causing damage to sea walls that have stood for 150-odd years. "The wind strength wasn't all that high, but the sea was absolutely beyond understanding. In the harbour you have a 40ft sea container that was washed approximately 200m, took away some fencing, and went straight into the harbour. "There were also sea defence boulders weighing up to 200 kilos washed 150m along the esplanade, so that gives you the size and some sort of scale of the energy of the whole thing." High tides and severe weather led to 25 people being taken from sheltered complexes at Stonehaven in Aberdeenshire. They were taken to St Bridget's Hall in the town, where a rest centre was set up. Further north at Peterhead, about 30 people were evacuated from properties in the Roanheads area. Some went to stay with friends while others were given accommodation at a hotel, according to Aberdeenshire Council. The town's RNLI lifeboat launched in what were described as "horrendous" conditions at 02:30 to rescue three people marooned on the east side of Peterhead harbour. People at a care home in Huntly, which sits inland at the River Deveron, were told to prepare to leave but later given the all clear. A spokeswoman for Aberdeenshire Council said the high tide again reached Stonehaven at about 14:30 on Saturday, causing further coastal flooding. People evacuated from affected properties earlier in the day remained out of their homes, with most having been collected by friends or family and alternative accommodation has been found for others, including at the new Edenholme care village in Stonehaven. However, the spokeswoman said the second bout of flooding was not expected to be as serious as the morning had been. It was also not expected to affect any properties which had not already been affected, although the situation was being closely monitored. A flooding advice centre will be set up at Aberdeenshire Council's housing office on Allardice Street in Stonehaven on Monday from 11:00 until 16:30. Elsewhere, a 15m section of the harbour wall collapsed in Lossiemouth. Police and council staff were at the scene and warned some flooding was possible at high tide. They also urged people to stay away from the area until it was made safe. The village of Kingston in Moray was said to have been completely cut off after its sea defences were breached. In Wick, on the far north coast, roads were closed and fishing boats were damaged in high winds. About 12 cars were moved from a car park when a strong surge breached a river bank, police said, and several roads were closed by debris thrown up by the waves. In the town The Shore, Harbour Quay and South Quay were closed. Huge waves caused part of the harbour wall at Balintore, near Tain in Ross-shire, to collapse, with two boys aged 12 and 14 suffering minor cuts after being thrown to the ground by the force of the water. Resident George Wood, 52, said: "I've lived in Balintore all my life and I've never seen it this bad before. It's devastation. The wall should have been repaired long ago." And storm force winds continued to batter Shetland throughout Saturday, with the road through Sandsayre in Sandwick flooded. The force of the waves combined with the high tide ripped up part of the beach and lifted some of the boats onto the road, and the nearby boat museum was flooded. The Scottish government has convened its Resilience Room in response to the storms. Environment Minister Paul Wheelhouse said: "Local emergency services moved quickly to deal with the aftermath of the flooding, which was caused by unusually high tides and high winds, in Stonehaven and Peterhead. "Emergency staff are also monitoring the situation at Lossiemouth. They have all demonstrated the utmost professionalism in the face of very challenging weather conditions. "Local residents affected by the floods have been moved to safety and offered support. I want to express my sympathy for their ordeal." Mr Wheelhouse also passed on his condolences to the family of a crewman killed when an oil support vessel was hit by severe gales. "These are tragic circumstances and my thoughts are with his loved ones at this difficult time," he said.